Sridevi's filmmaker husband Boney Kapoor performed the last rites at the ceremony. The couple's daughters, Jahnvi and Khushi, were by his side. The actor's body was brought to the crematorium in an open, flower-bedecked hearse. Sridevi's untimely death at the age of 54 in Dubai on Saturday had stunned the nation. Image Source : SCREENGRABLast journey of actress Sridevi - from Celebrations Sports Club in Andheri West to Vile Parle crematorium. 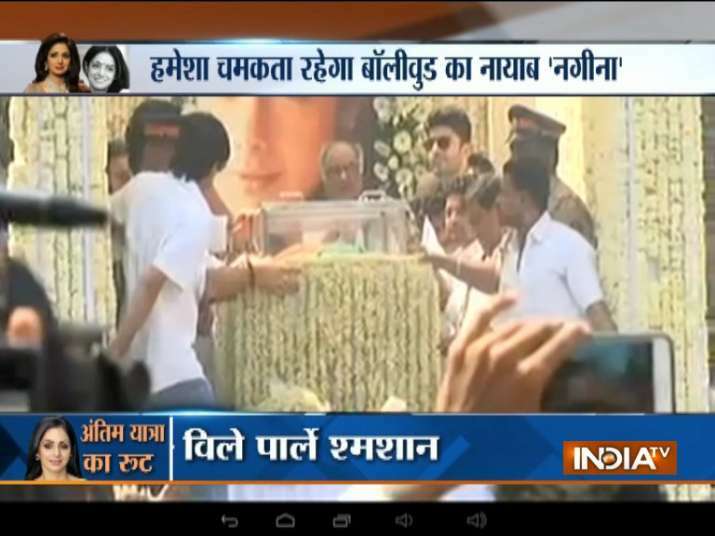 Husband Boney Kapoor seen with the mortal remains of actress here. "Paid my last respects to Sridevi. The entire industry was there grieving, some on the verge of breakdown. Such was her aura & magic in films. She lay there, beautiful in a red saree, serene in death & totally at peace." "Arrangements were so well made that the whole atmosphere was tranquil, everything was smooth & executed with finesse - befitting the departed soul. Goodbye dear friend!" 12:09 pm: Queues of fans seeking the last glimpse of Sridevi run up to kilometers. 11:30 am: Students of primary school owned by the family of Sridevi paid tributes to the actress in Sivakasi, Tamil Nadu. 11:21 am: Sridevi's fans, who were allowed to pay their last respects to the legendary actress, burst into tears. The crowd continues to increase in volume. Minor scuffle reported. 10:21 am: Fans to get a chance to pay respects to Sridevi at the sports club. 10:09 am: After the prayer meet, a special puja will be organised at the club, which will only be attended by members of the family. The last journey of the legendary actress Sridevi from the sports club to the crematorium will begin at 2pm. 10:00 am: Satish Kaushik, Sonam Kapoor, Subhash Ghai and Farah Khan reach Celebration Sports Club to pay last respects. 09:46 am: Huge number of fans have gathered outside the sports club. Fans have come from Uttar Pradesh, Rajasthan, Gujarat and other parts of the country to pay their last homage to the legendary actress. 09:45 am: Aditya Thackeray, Karan Johar, Sridevi, Arbaz Khan among celebrities reaching Celebration Sports Club to pay last respects. 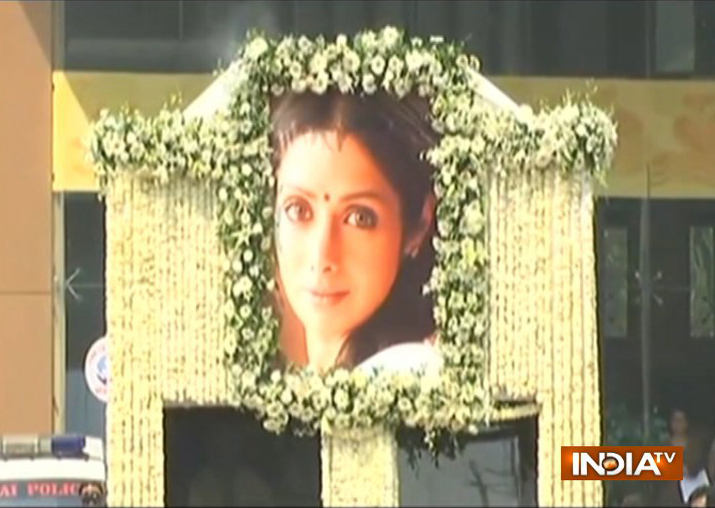 09:05 am: Mumbai: Sridevi's mortal remains brought to Celebration Sports Club, where people will pay their last respects to the actor, funeral to take place later today. 07:00 am: As per her last wishes, Sridevi's funeral will be all white. 06:42 am: Heavy crowd continues to gather outside Sridevi's Mumbai residence as fans from across the nation pour in for the last glimpse. The police have increased security around her residence. The road outside her house Green Acres has been cordoned off. A heavy presence of private and police guards near her house. 06:30 am: Sridevi ji helped in brother's operation for brain tumour. She gave us RS 1 Lakh and got the hospital to given concession for another RS 1 Lakh. Today my brother is alive because of her. I cannot do much for Sridevi Ji, but I can at least be part of her funeral procession: Jatin Valmiki, a visually impaired man from Uttar Pradesh who has been waiting outside Sridevi's house since last two days. 06:15 am: After clearance from Dubai authorities, family members, including her film-maker husband Boney Kapoor and stepson Arjun Kapoor, brought her body in a private jet after three days of uncertainty over her unexpected death on Saturday in Dubai. 06:00 am: Sridevi's mortal remains arrived in India late last night amid chaos. 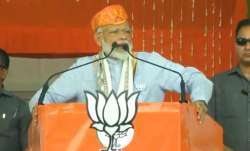 As the ambulance entered her residence in suburban Andheri, a large number of fans jostled for a glimpse of their favourite actor. Both sides of the road leading to Sridevi's 'Green Acres' residence in Lokhandwala were crowded with her fans, with some even climbing the trees to have a clear view. 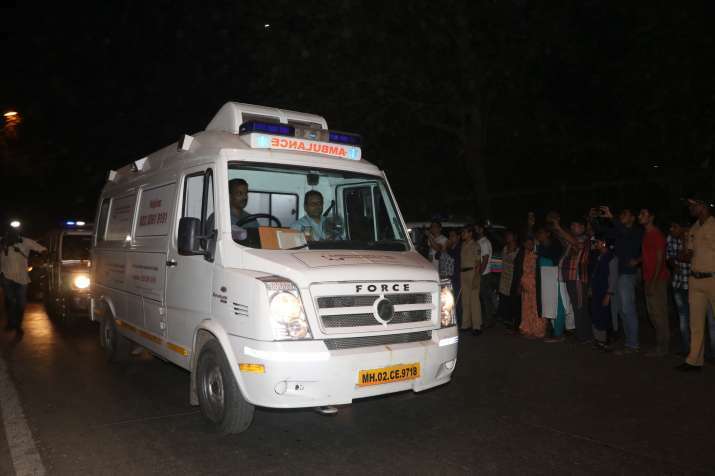 The ambulance, escorted by three police vehicles, brought the body home from the airport at around 10:30 PM soon after it arrived from Dubai where she died three days ago at the age of 54. 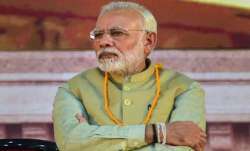 Image Source : PTIAs the ambulance entered her residence in suburban Andheri, a large number of fans jostled for a glimpse of their favourite actor. 05:50 am: Dubai Public Prosecutor's Office put an end to speculation about the cause of her death, saying she accidentally drowned in the bathtub following loss of consciousness, and that the "case was now closed".